Monica Belluci and Roberto Bolle attended the "Charles James: Beyond Fashion" Costume Institute Gala at the Metropolitan Museum of Art on 5 May 2014 in New York City. Both Monica Belluci and Roberto Bolle were dressed by Dolce & Gabbana for the event. Monica Belluci and Roberto Bolle were my favourite pairing for the evening. Monica Belluci looked exquisite, and Roberto Bolle added the much required dose of drama for this event. 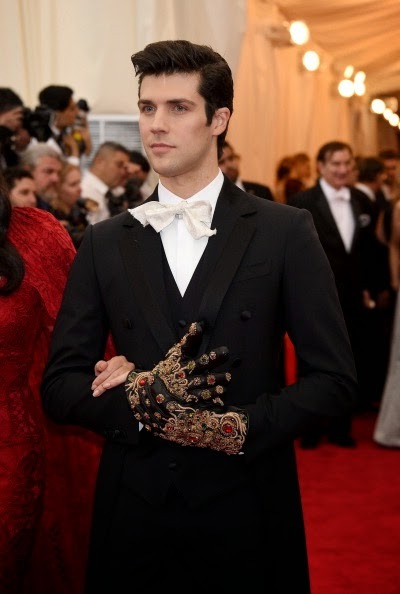 There were many well dressed personalities at the ball, but Roberto Bolle's bejewelled gloves and slippers from Dolce & Gabbana Fall Winter 2014 just pushed it to another level. I mean, where else can one wear those stunning rhinestones encrusted pieces? Excellent grooming and poise from the professional ballet dancer. Stunning. I can't help but wonder, where you at the Met Gala? DId you have fun? Ms Wintour did not invite me! Ok, the way you wrote about the red carpet event made me think you were actually there.